Last week, Mark Lippert was slashed by a Korean nationalist. While he was in hospital, hundreds of Koreans got hyped to apologize the attack. Why are they so extreme? 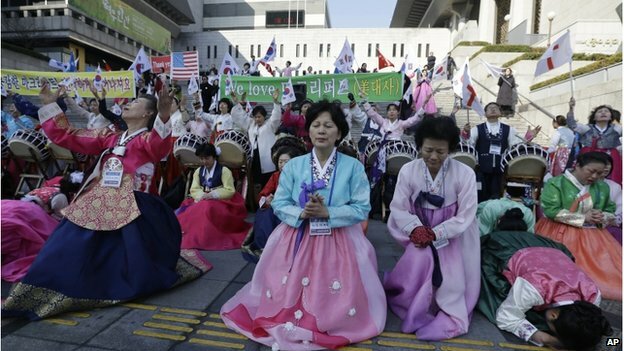 In Korean sense, the rally was meant to "America must forgive us because we are extremely sorry for him, caring for him." They don't want to be criticized for "Korean faults" because of their confucianism sense--being pointed out faults means they are inferior which they can't stand. Another reason is, Koreans are scared of America to be on victim position. Koreans have a sort of sense like victim can do anything to the offender. This time, Korean medias emphasized the man was PyongYang loyalist and "we Koreans" were also victims therefore both America and S.Korea can be on the same victim position. Diet member Nakayama explains Korean Americans' "Uriginal" lobby made America revise school textbooks. 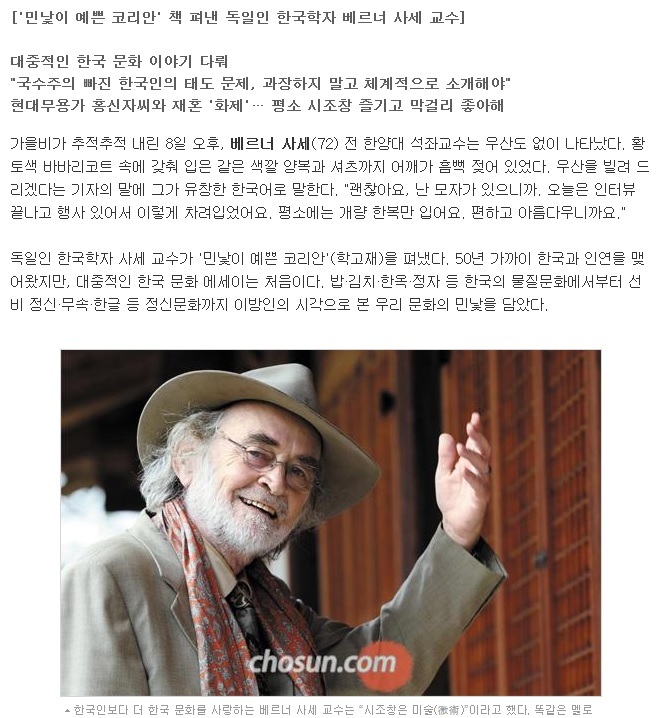 [Korean News] God chose 3 races, Jewish, German and Korean. "The God of history seems to like drama. Since the 20th century, the god chose 3 races as lead actors. Jewish, German and Korean." Title "Korean is the most excellent race in the world"
There are 3 excellent races in the world, Korean, Jewish and German. Particuraly Korean is the best among them. 이 세계에는 우수한 세 민족이 있는데 한국민족, 유대민족, 독일민족이라는것이다. 이 중에서도 한국민족은 가장 뛰어난 민족이라고 한다. http://ninjer.blog.shinobi.jp/korea%20issue/-korean%20news-%20god%20chose%203[Korean News] God chose 3 races, Jewish, German and Korean. "Foreigners will run away if you say "We" in the first 15 minutes. When you introduce Korean history, you shouldn't emphasize "We" . Korean foods, Korean houses, Korean language, all are great but if you propagandize them as "One of a kind" that sounds like nationalism. Koreans need to recognize Korean culture is as unique as other cultures rather than "Korea is the best"." He criticizes "Korean nationalism is the problem" "'5000 years of history' is fantastic word but you need to prove it scientifically. If you boast such a thing in outside of Korea, you will be a complete fool . It is better to show realistic history to foreigners in a structured manner instead of overdramatizing." Here's one of the complete fools. "hangule has been admitted as one of the world's greatest letter"
Korean newspaper Chosun Ilbo had an interesting article. 1. Launch a verbal battle agressively from the beginning. 특 히 NSTB가 적극적으로 펼치고 잇는 협상전략이 바로 우리 조종사들의 자질을 폄하하여 사고 원인으로 몰고 가는 ‘우물에 독약타기(Poisoning the well)’ 즉, 언론을 통한 신뢰·자질 흠집 내기 전략임을 명심해야 한다. 우리도 NTSB와 보잉의 공정성과 신뢰·자질에 지속적인 문제 제기를 언론을 통해 하는 것이다. NTSB is trying to deprecate quality of the pilots of our country to blame the accident "Poisoning the well"
Their strategy is damaging our quality, we must provoke problem of fairness of NTSB and Boeing through the media. 2.Propagate American people can be victim of Boeing's defected airplane. ‘공공의 적(Common enemy)으로 몰아가라’ 전략이다. Create common enemy, it is a strategy. Form a coalision with friendly organizations. ‘공공의 적’ 전략을 한층 공고히 하기 위해선 한국과 같은 피해자 입장에 있는 기관이나 단체와의 연대대응 동맹연합(Alliance) 전략이 필수적이다. 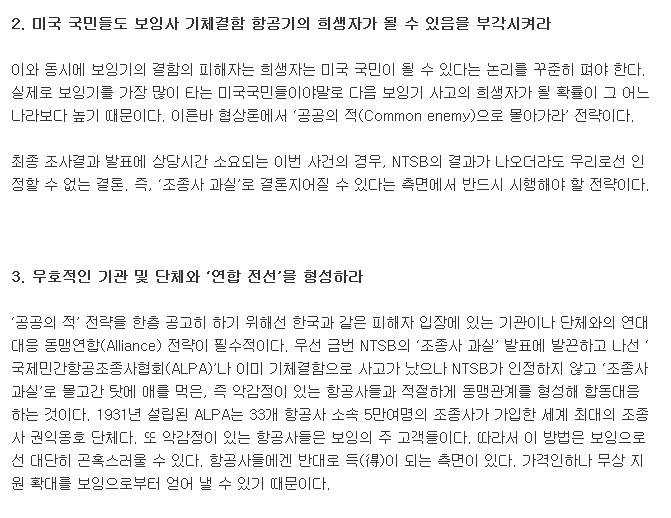 To strengthen operation "Public Enemy" it is neccesary to foam an alliance with victim orgamizations like Korea. 즉 악감정이 있는 항공사들과 적절하게 동맹관계를 형성해 합동대응하는 것이다. In other words, joint coalition with airline companies that hold bad feelings toward NTSB. The Korean government needs to protest through diplomatic channels. 5. FX 사업참가 업체인 보잉에게 대한민국 국민정서를 악화시키지 않는 게 좋을 것이라고 경고 압박하라. 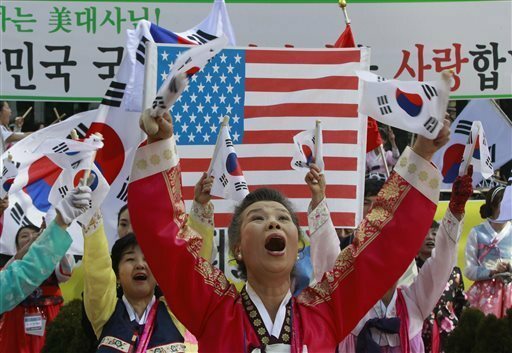 5.Warn Boeing that Anti-America feeling among Koreans could effect selecting F-X. 만약 ‘조종사 과실’로 계속 몰고 간다면 수조원 짜리 FX 사업에서 보잉을 선택하는 정부를 대한민국 국민들은 용서치 않을 것이다. If they blame the pilot, Korean people will not allow their government to buy F-X from Boeing. 이런 협상전략은 결국 미국 정부에게 더 이상 NTSB가 부당하고 파행적으로 보잉을 감싸고 도는 행위에 제동을 거는 효과를 낳을 것이다. Negotiation strategy like that will make the American government put pressure on NTSB. Korea's childish diplomacy with Japan has been featured by English medias. But they seem to know only recent events between the two countries, so I recommend to read this article written in 107 years ago. 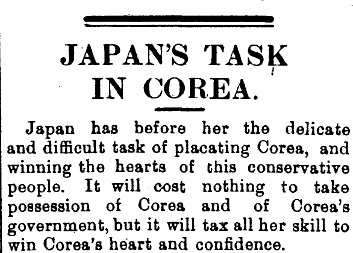 Koreans were already Japan haters before being occupied by Japan. The reason was not anything like history or territory dispute but simply racism caused by Confucianism. That is the core of Korea's Anti-Japan, they won't change, they won't understand criticism from outside. KCC(Korean version of FCC) announced to ban web sites and internet communities which are friendly to Japanese but critical to Koreans and Korean history. What interesting is they are going to ban criticism. That is something what dictatorship country does. And it reminds me Chosonninja's Narcissistic personality disorder. One of symptoms was "Hypersensitivity to real or imagined insults that could result in feelings of extreme shame and humiliation"
Such behavior proved this video was true. Anti-Japan brainwash in Taekwondo school? A scene from Japanese TV show. The girl is challenging Karate's Itawari in a Taekwondo dojo. Japanese national flag is pasted on the punching bag. They sound almost same as Korean nationalists. The typical one is "Japan invaded Korea in WWII so Koreans can copy and uriginalize Japanese culture"
Yup, they didn't know Korea was collaborator of Japan during WWII. And they don't realize how the logic makes no sense. Phillippinos do not uriginalize American culture, uriginalism is a Korean mental problem. http://ninjer.blog.shinobi.jp/korea%20issue/anti-japan%20brainwash%20in%20taekwondo%20school-Anti-Japan brainwash in Taekwondo school? Korean teacher "The Korean language is the greatest"
http://ninjer.blog.shinobi.jp/korea%20issue/korean%20teacher%20%20-the%20korean%20language%20is%20the%20greatest-Korean teacher "The Korean language is the greatest"
Narcissistic personality disorder (NPD) is a personality disorder in which the individual is described as being excessively preoccupied with issues of personal adequacy, power, prestige and vanity. Narcissistic personality disorder is closely linked to egocentrism. When I read that, I realized Uriginal mentality and the disorder were same. And here the symptoms.Don't these remind you Chosonninja?